Miniature thrust bearings must be kept in matched sets. The bore (d dimensions) of one washer in the set will conform to the data in the above charts. The bore (d dimension) of the mating washer will be roughly .007" larger, because it is a clearance hole for the shaft. Miniature thrust ball bearings (or axial bearings) are available with bore sizes as small as 2mm. 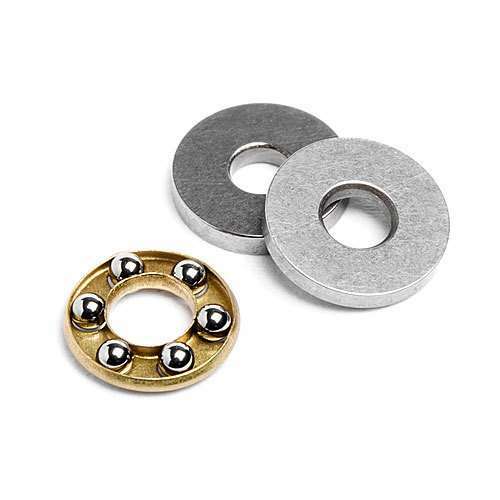 Miniature ball thrust bearings are normally supplied in SAE52100 chrome steel with brass retainers but can also be manufactured in stainless steel (possibly subject to minimum requirements). Miniature thrust bearings can withstand axial or thrust loads only. There are separate types of miniature thrust axial bearings with either flat washers or washers incorporating a groove or raceway for heavier loads. The grooved type have one washer with a slightly larger bore to allow it to locate in the housing while the other washer has a smaller OD to locate on the shaft. This is not a common bearing. So if you can not find the size you need, pleas don't worry. You can contact us and we can provide customized service based your demands. There are many different designs of miniature thrust bearings which involve different materials, with groove or without grooves as well as imperial size. You can view sample pictures here.